Ryan Bennett scores for Posh against Plymouth in 2011. 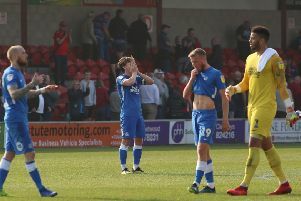 Peterborough United have been handed an attractive League One opener at home to newly-promoted Plymouth Argyle on Saturday, August 5. Plymouth are usually backed by a big travelling support so a bumper crowd can be expected at the ABAX Stadium. Posh last played Plymouth in a League One game in April, 2011 when goals from Ryan Bennett and Craig Mackail-Smith secured a come-from-behind 2-1 win for a team heading for promotion. Posh open their away programme at Bristol Rovers on August 12 and the first month of fixtures is completed by a tasty away trip to Northampton over the Bank Holiday weekend (August 26). The return derby against the Cobblers at the ABAX will take place on Easter Monday (April 2). Posh travel to Rotherham on Easter Saturday (March 31). Christmas is not kind to Posh as they travel to Bradford City on Boxing Day and then MK Dons on December 30. Darren Ferguson’s Doncaster Rovers visit the ABAX on New Year’s Day. MK Dons are early visitors to Posh on Tuesday, September 12, one of five midweek night games currently scheduled. Posh have Tuesday evening away matches at Oldham (September 26) and Southend (October 17). Posh finish the season on May 5 at Portsmouth. Pompey are Tuesday night visitors to the ABAX on November 21 which will disappoint Posh as that would have been another big weekend gate. Posh host Barnet in the first round of the Carabao Cup - the Football League Cup - probably on Tuesday, August 8. Reaction: McCann confident of a flying start, bookies are not so sure. See more Posh fixtures, team details and stats.